It’s Follow-Up Friday: Wordplay-action pass edition! 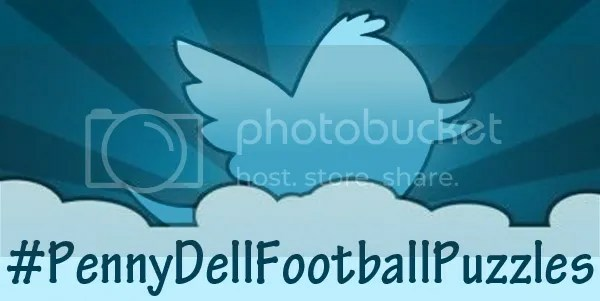 And today, I’m posting the results of our #PennyDellFootballPuzzles hashtag game! For the last few months, we’ve been collaborating on puzzle-themed hashtag games with our pals at Penny Dell Puzzles, and this month’s hook was Penny Dell Football Puzzles, mashing up Penny Dell puzzles and the world of American football. Players, teams, plays, terminology, anything and everything! Examples include: The San Francisco Three-From-Niners, Coin Tossing & Turning, or Joe Namathboxes! Beat the Clock: 2 Minute Warning Edition! And @Francespuzzles blitzed us with many choice entries, including Extra Point the Way, Fourth & Aft, A Perfect Ten Yards, Gale You-Don’t-Sayers, Face to Facemask, Incomplete-A-Word, Across & First Down, Placekick Your Number, Solve & Sack, and my personal favorite, Fran Tar-KenKen-ton. Have you come up with any Penny Dell Football Puzzles of your own? Let us know! We’d love to see them! This entry was posted in Games, PuzzleNation, Puzzles and tagged @midnight, About Us, american football, Arizona Cardinals, Bart Starr, Cris Carter, DIY puzzling, Emmitt Smith, End zone, Fearsome Foursome, first down, Follow-Up Friday, football, Fran Tarkenton, Gale Sayers, games, Geeking Out, Grandstands, Green Bay Packers, Halftime show, hashtag, hashtag game, Howie Long, Jim Brown, Joe Montana, Joe Namath, John Madden, kakuro, Marshawn Lynch, Miami Dolphins, Michael Strahan, Mike Ditka, NFL, Penny Dell Crossword App, Penny Dell Crosswords App, Penny Dell Puzzles, Penny Press, Penny/Dell Puzzles, Philadelphia Eagles, placekicker, Pop culture, PuzzleNation, Puzzlin' fool, Quarterback, Razzle Dazzle, San Francisco 49ers, Schmovie, St. Louis Rams, Tim Tebow, Tom Brady, Walter Payton, Wordplay, zone defense by gmdirect. Bookmark the permalink.